We may collect personally identifiable information (“PII”) such as your name, your contact information, your shipping information, and your billing information (such as credit card account data). We collect PII when you provide it to us through your use of the Patagonia Services, for example when you interact with our websites, place an order, or sign up for our mailing list. We also receive limited PII when you choose to download or request the App. We may combine the PII we collect with additional information from other third-party sources. We use the PII that we collect to provide the Patagonia Services (such as to process and ship your orders or respond to customer service requests), to analyze and improve the Patagonia Services, and to conduct marketing. If you register for email or if you provide your email address to us, we will send you emails about a variety of topics such as store events, new products, special sales, promotional offers from our affiliates or other selected business partners, environmental issues, and employment opportunities. Please see below for your choices regarding how we collect, use, and share your PII. We share email activity data with our marketing email provider to help them better target email deployments to consumers. While our marketing email provider has access to email address and email activity and may share bulk/non-specific activity data, no Email addresses or specific email actions are ever shared with other third parties. Should a consumer wish to opt out of this sharing, that consumer simply needs to opt out of marketing email from us. Our App uses the GPS feature of your mobile device to determine the location of the device. We and our third-party vendors or partners may collect and use this geographic location data for purposes such as the functioning of the App, to make our advertising more relevant, and to improve Patagonia Services. For example, we use the location information to provide the address and directions for the nearest Patagonia retail location. We do not store geographic location data in combination with PII. If you do not want us or third parties to collect and use your device’s geographic location, you can control this function in your application settings (if your device offers this type of control), by disabling location services for your device, or by uninstalling the App, but these choices will affect your ability to use the App. We automatically collect certain non-personal information when you use Patagonia Services. For example, we collect information about the devices you use to connect to our services (such as the IP address of your computer or numeric identifier of your mobile device) and about how you use Patagonia Services (such as what time you visit our websites). 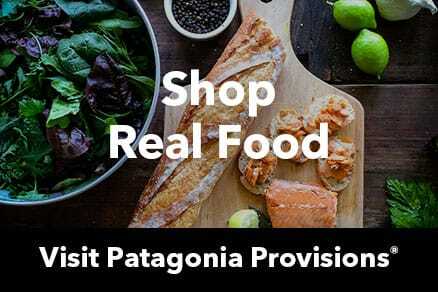 We, and our advertisers and ad servers, may also collect non-personal information outside the Patagonia Services to measure the success of our advertising campaigns. We use the non-personal information that we collect for a variety of purposes such as to provide and improve the Patagonia Services, and to analyze and offer our advertising. Our website also uses third-party analytics vendors such as Google Analytics.Please click here for more information about how data is collected and processed in connection with the Google Analytics service: www.google.com/policies/privacy/partners/. We and our third-party vendors or partners use analytics data for a variety of purposes such as to improve the design and content of our websites, to help us learn things like what pages are most attractive to all of our visitors and what promotions visitors like to see, and to gauge the success of our advertising campaigns. All information that you share about yourself, whether PII or not, in a public open forum – such as on a social network – will be considered public information for the purposes of this policy. If you don’t want it to be public, please don’t post it. If we are involved in a merger, acquisition, bankruptcy, partial or total sale of assets, or other corporate change. We may disclose de-identified, aggregated, or other non-personal information to third parties in our discretion. The Patagonia Services or our offerings on social media platforms may include commenting, forums, sharing, or other similar features. Information that you provide using these features may be available to other users or the general public. With your PII – like the information you give us to fulfill an order – you have the option to change or correct your information and the choice of not hearing from us again. There are several ways you can control our use of your PII in connection with marketing and promotions. To remove your name from our lists. You can choose to decline communications from us at the point that we request your PII. After we have collected your PII, you can choose to stop our communications or our service, or stop us from sharing your information with other companies for their marketing purposes. To exercise any of these options, please contact us by mail, email, or telephone using the contact information below. To stop collection of geographic location. If you do not want us to collect your device’s geographic location through our App, you can disable that function when you first use the App or in your device settings. This will prevent you from using some features of the App. If you would like to request changes to the PII that you have previously provided to us, please contact us by mail, email, or telephone using the contact information below. Most browsers accept cookies automatically. You may be able to set your browser to reject and/or delete cookies. For instructions, check your browser’s technical information. However, if you reject or delete cookies then this may disable or interfere with features of the Patagonia Services or other websites you visit. We recommend that you leave cookies “turned on” so we can offer you a better shopping experience on our sites. We may work with third-party advertising companies that collect and use information about your online activities across sites over time, in order to deliver more relevant advertising when you are using the Patagonia Services and elsewhere on the Internet. This practice is known as interest-based advertising. You may visit www.aboutads.info to learn more and to opt out of this type of advertising by companies participating in the Digital Advertising Alliance self-regulatory program. We do not operate or control this site, and are not responsible for the opt-out choices available there. Note that electing to opt out will not stop advertising from appearing in your browser or applications. It may make the ads you see less relevant to your interests. If you delete, block or otherwise restrict cookies or use a different computer or Internet browser, you may need to renew your opt-out choice. The online Patagonia Services are not intended for the use of individuals under the age of 13, and we do not knowingly collect information online from individuals under the age of 13. Our websites and App may contain links to third-party online properties. Such third parties have their own policies that govern their collection, use, and disclosure of information. We suggest that you read their privacy policies to learn about their practices. We have reasonable and appropriate physical, electronic, and administrative measures in place to safeguard the security of your personal information. However, when you communicate with customer service via email or chat on our websites, these communications may not be encrypted. For that reason, we ask that you do not share sensitive information via these communication channels.